Products of the Pasteur era, Biology laboratories have gone through many stages. The first laboratories are, even before the term is invented, "Public Health Laboratories". - To organise a "public vaccination service" against smallpox, rabies and anthrax by preparing the appropriate vaccines on the spot. - To study the parasitic illnesses that afflict mankind. - To undertake new research, by applying the methods of Pasteur, on cholera, dysentery, beriberi and malarial fever. When he lands in Saigon, on the 7th of February 1891, Calmette* has just two rooms at his disposal in the Marine Hospital, the future Grall Hospital. Five years later, having been appointed to Senegal, Marchoux* arrives in Saint-Louis on the 29th of February 1896 to create the first microbiology laboratory in Black Africa. He too is scantily accommodated in the premises of the military hospital. Thus, at the beginning, for reasons of convenience, biology laboratories are located in the hospitals, whose capacity of diagnosis is thereby strengthened. Thus it is that Marchoux* practises the first blood culture in Black Africa. But the main obligations of these laboratories are the maintenance of public health and the pursuit of research. Later, established on their own premises - in Saigon in 1896, in Dakar in 1924 - they are transformed into subsidiary branches of the Paris Pasteur Institute. Henceforth, a separation of tasks is to be observed and biology laboratories are maintained or created to ensure the multiple analyses and extra-clinical examinations that are a part of hospital work, obviously all the more necessary as most of the colonies don't have a Pasteur Institute. 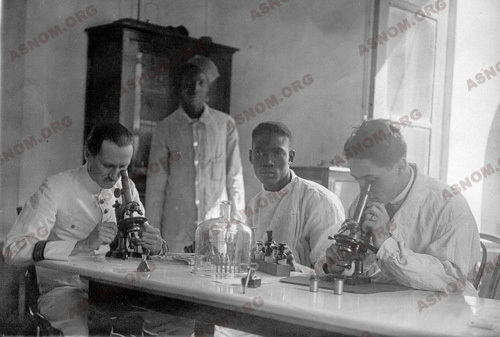 After the one in Senegal, a laboratory is established in each Black African colony. Madagascar and the other territories are also provided with Biological services in the hospital of the capital. External consulting physicians have access to these services. The director of the service is a doctor or a chemist of the Colonial health Service working with native laboratory assistants. The physicians have followed the "great courses" on microbiology and serology-immunology at the Pasteur Institute in Paris. After the Second World War, laboratories become more numerous. In Antananarivo or in Dakar, for example, every hospital has a Biological service. In the big cities, the establishments outside the hospital which are very beneficial, such as polyclinics and hygiene institutes, possess laboratories. Little by little, in the 1960s, private laboratories for medical analyses are opened. After many failures followed by the discovery of blood groups in 1900 by Landsteiner and of the necessary compatibility between blood donors and receivers, blood transfusion begins to be practised in Europe about 1910. In the tropics, until the Second World War, it is exceptionally resorted to and limited to hospitals. After an extemporaneous and summary control of blood group compatibility, transfusions are made directly from arm to arm using the statutory apparatus of Jouvelet*. Under the impetus given by the American Army, blood transfusion becomes ten times more frequent with the discovery of the Rhesus factor. 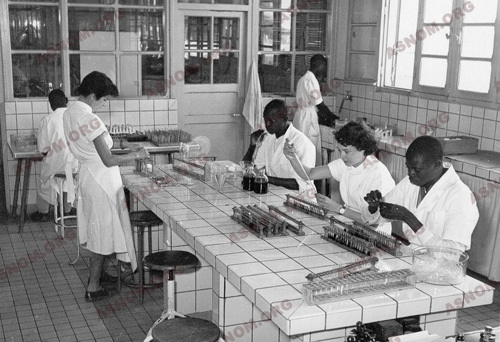 In Dakar in 1943, a "centre for collecting blood" is established to supply plasma for French troops. This task is given to the Dakar Pasteur Institute which performs it till 1950. Initially meant for military units, this centre rapidly becomes a supplier of civilian needs. 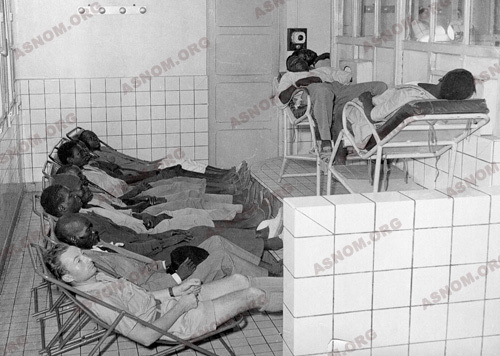 In August 1949, Le Rouzic*, Director of Public Health in the French West African Territories (AOF), decides to establish in Dakar a "Federal Centre for Blood Transfusion" which is inaugurated on the 15th of April 1951. Its direction is confided to Linhard*, a colonial hospital biologist. With very modern installations, this centre soon proves to be very efficient. In the first six months of activity in 1951, 1 939 donors are registered of whom two-thirds are Africans, and 3 500 blood samples are taken. The delivered products consist of whole blood called "sang rouge" or plasma (liquid or dry). Every fortnight, a dozen hospital centres in the AOF and Cameroon receive samples of blood and plasma in isothermal containers, by train or plane. Besides these regular deliveries, supplementary provisions are assured in case of necessity. The Blood Transfusion Centre also participates in scientific research and Linhard* wins fame for his study of syphilitic serology, the evidence in the blood of viral hepatitis and of certain diseases of the red corpuscles, characteristic of Africans. After Independence, the centre becomes national and Senegalese. It is modernized and enlarged. Other capitals, such as Abidjan, establish their own blood transfusion centres. Native physicians from many African states come to specialize in Dakar. In Senegal itself, the National Blood Transfusion Centre (CNTS) continues to develop. In 1972, it registers 12 622 donors. Every week the inland hospitals are supplied with blood and plasma. Three blood banks supply the needs of the CNTS, one at the Principal Hospital of Dakar, the others at Saint-Louis and Diourbel. The only problem is the high cost of running this type of establishment, the expenses being entirely assumed by the national budgets.